I't not easy being a child, especially when the child has a disability. Just like any normal child, children with disabilities wants to be accepted, valued, loved and feel included particulary by their peers. Dr. Nancy Spencer-Cavaliere, an adapted physical activity expert, in the Faculty of Physical Education and Recreation at the University of Alberta, interviewed children with a range of disabilities about their thoughts on what made them feel included or rejected during these activities. "Children were asked to theorise about other fictional children who are like them, so they didn't have to pour their hearts out initially if they didn't want to. So I'd start by saying, 'Imagine if you were…"
Three themes emerged from the data: gaining entry to play; feeling like a legitimate participant, and having friends. 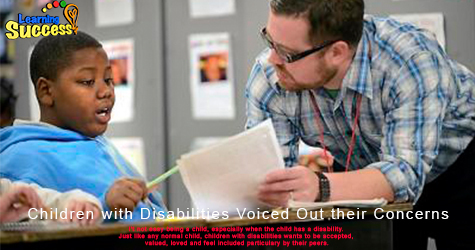 "So what's a teacher, coach, parent to do to help kids with disability feel included? "When in doubt, ask the child," says Spencer Cavaliere. "You get valuable information and it gives them a say." Dr. Spencer-Cavalier emphasized that there is no specific solution because all children need to feel included by having legitimate choices they could choose from to experience inclusion.